Rich, buttery, and so deliciously creamy, hollandaise sauce is often described as the ultimate breakfast or brunch sauce. 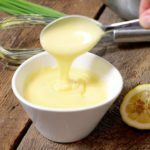 Often believed to be notoriously difficult to make, hollandaise sauce is one of the 5 Mother sauces of French cuisine and isn’t so much difficult to make as it is finicky. While it is most often served with breakfast (think poached eggs or smoked salmon eggs benedict) as a breakfast sauce, it also pairs very well with salmon, asparagus, and other grilled vegetables. Something that bugs me to no end as a professionally trained chef is when others say they love making eggs benedict, yet don’t make their own hollandaise from scratch. True, it’s not the easiest sauce to make, but with patience and practice, real hollandaise sauce is achievable for anyone. Why Make Hollandaise From Scratch & Not Simply Buy It Instead? The powdered commercial substitutes you can buy in grocery stores are far cry from the real deal. Many will argue that store bought hollandaise is easier to make, won’t split, and is more cost effective. While it’s true it may be cheaper, that doesn’t mean it tastes the same or is better for you. As for the claim that the store bought powder is easier to make, I would have to disagree. Making hollandaise sauce from scratch is fairly simple if you follow a few simple steps, and with practice, you’ll be able to make it at home in as little as 15 minutes. 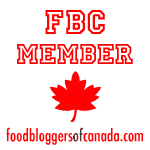 So How Do You Make Hollandaise Sauce From Scratch? Often touted as a food item only professional chefs can make, this creamy buttery sauce can be made by anyone willing to learn. As one of the five mother sauces of French cuisine, making hollandaise is an essential cooking skill for any budding chef. 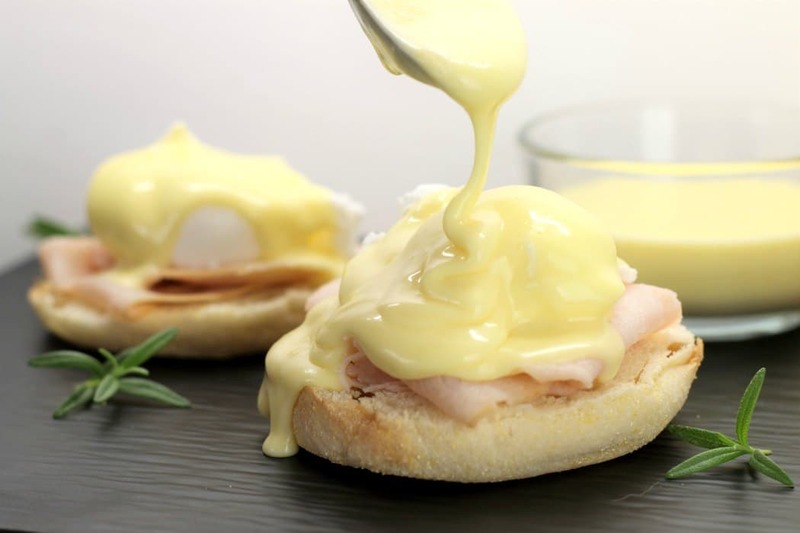 A classic hollandaise is simply an emulsion of butterfat in egg yolks. In plain English, that means the egg yolk is used to thicken and hold together the combination of white wine reduction and butter. Another popular example of an emulsion is mayonnaise or a creamy vinaigrette. Traditionally a classic French Hollandaise consists of three ingredients. With practice, these ingredients can be eye-balled, but it’s important to know there is only a certain amount of butter an egg yolk can emulsify before the sauce will ‘split’. 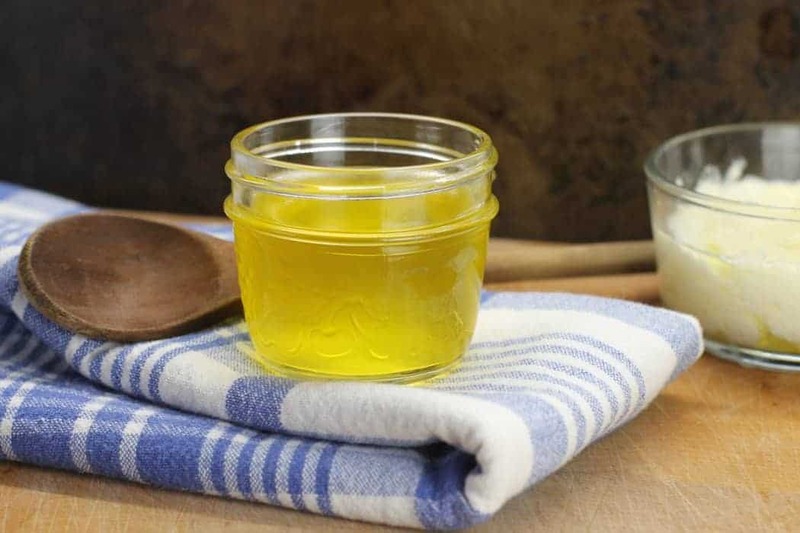 One egg yolk will properly emulsify half a pound of clarified butter. If you want to make a larger batch for example with one pound of butter you’ll simply need more yolks. 3 tbsp white wine reduction, (any acid will do and even straight lemon juice will work instead of using a reduction). 2. Crack the eggs and separate the yolks into a large bowl. Add your white wine reduction (or lemon juice if using) to the egg yolks. Place the bowl over the double boiler and whisk the egg/wine mixture with one hand while holding the bowl in the other. You need to vigorously whisk the egg yolk back and forth as you are trying to incorporate air into the eggs as the steam from the boiling water below starts to gently cook the yolk. Keep whisking the eggs until they become creamy, thicken, and leave ribbon-like trails in the bowl when you run the whisk through it. Once you reach this ribbon stage you are ready to emulsify the butter into the egg yolk. 3. Remove the yolk-filled bowl from the double boiler and cradle it in a ‘nest’ of kitchen towels on the counter. This nest will hold your bowl as you slowly whisk the hot butter into the egg mixture. 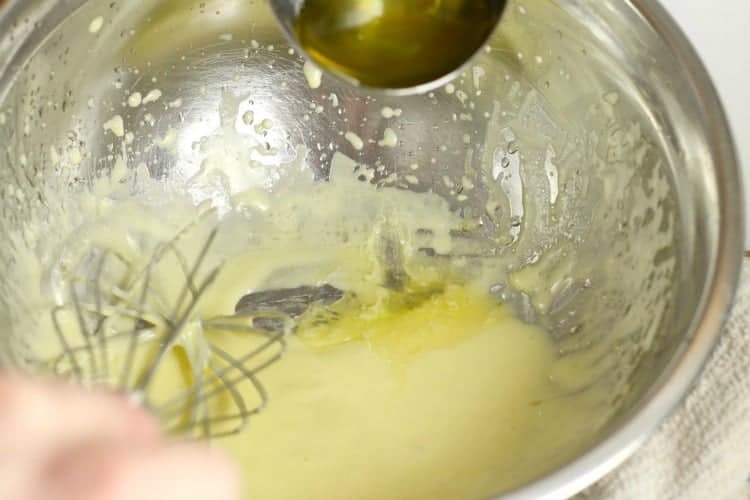 Adding one ladle of butter at a time, slowly drizzle the butter into the yolk, while simultaneously whisking it. 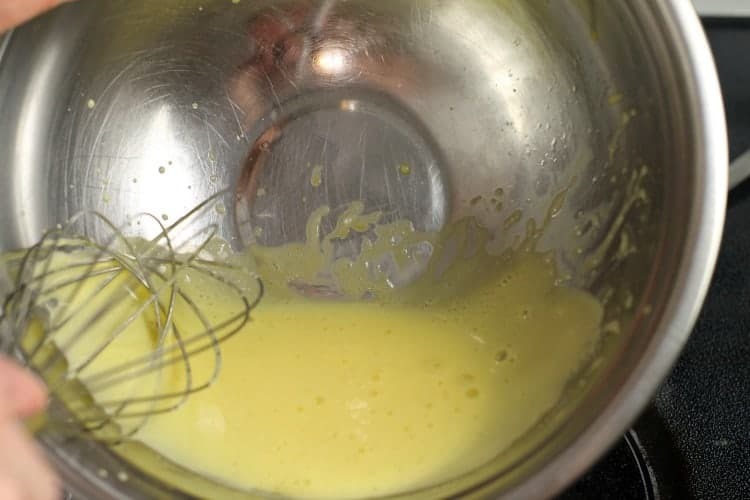 Make sure to completely whisk the one ladle of warm clarified butter into the egg mix before adding the next ladle. 4. Keep adding the butter to the egg mix, ladle by ladle, until the mixture thickens and becomes rich and buttery. 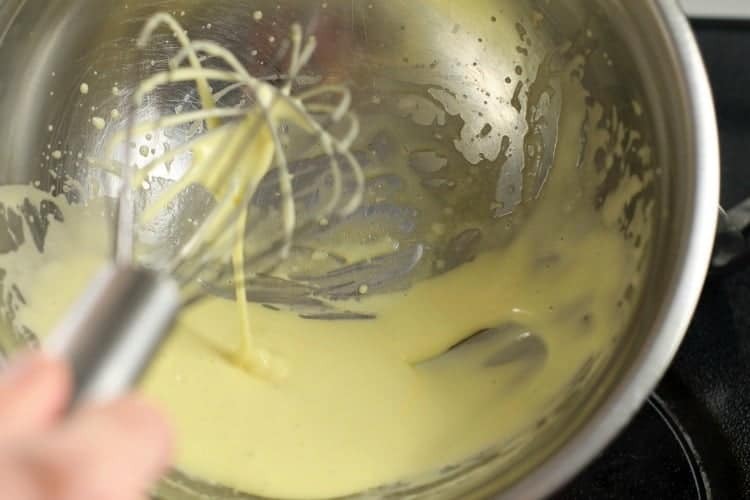 If the hollandaise starts to get too thick add a tiny splash of hot water to thin it out and immediately whisk it in. 5. Season the hollandaise with lemon juice and Tabasco if desired. It is important to keep hollandaise warm while getting ready to serve it. If the sauce is allowed to cool the butter will solidify and split out once reheated. If it becomes too hot the butterfat will separate from the yolks and create an oily mess. 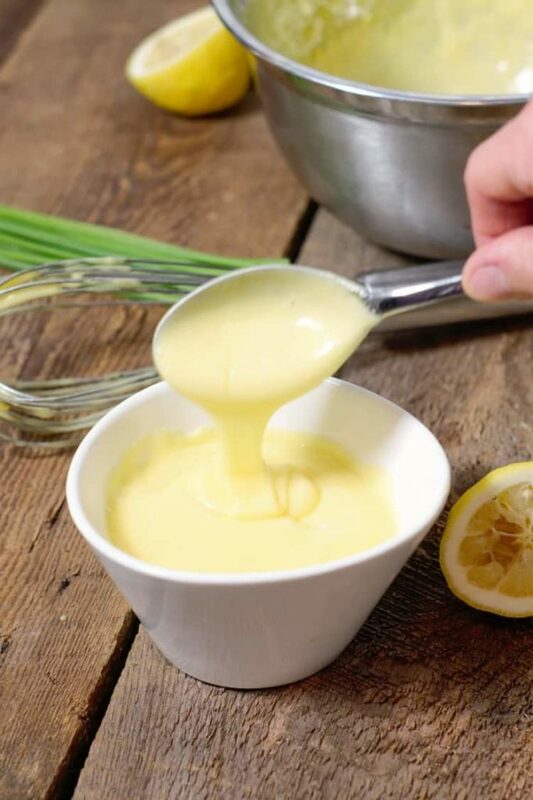 As hollandaise is one of the 5 Mother sauces, it can be used as a base to create other sauces, making it very versatile. The most common hollandaise derivative is Bearnaise sauce. In this variation, shallots and tarragon are added to the sauce, either in the wine reduction or finely chopped and added to the final product. Bearnaise sauce is often served with steak. Sauce Choron, is hollandaise sauce with tomato puree added. Sauce maltaise is hollandaise sauce with blood orange juice and zest added. Great for use with desserts. Sauce Dijon is hollandaise sauce with dijon mustard mixed in. 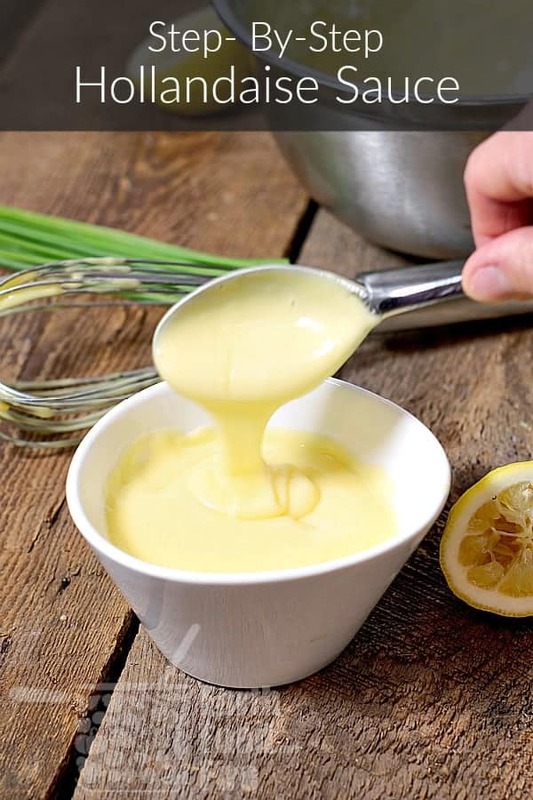 Hollandaise Sauce is one of the 5 Mother Sauces of French cooking. An essential skill for any home cook to have & the perfect addition to eggs and seafood! Crack the eggs and separate the yolks into a large bowl. Add your white wine reduction (or lemon juice if using) to the egg yolks. Place the bowl over the double boiler and whisk the egg/wine mixture with one hand while holding the bowl in the other. You need to vigorously whisk the egg yolk back and forth as you are trying to incorporate air into the eggs as the steam from the boiling water below starts to gently cook the yolk. Remove the yolk-filled bowl from the double boiler and cradle it in a ‘nest’ of kitchen towels on the counter. This nest will hold your bowl as you slowly whisk the hot butter into the egg mixture. Keep adding the butter to the egg mix, ladle by ladle, until the mixture thickens and becomes rich and buttery. Season the hollandaise with lemon juice and Tabasco if desired. There is only a certain amount of butter an egg yolk can emulsify before the sauce will ‘split’. One egg yolk will properly emulsify half a pound of clarified butter. If you want to make a larger batch for example with one pound of butter you’ll simply need more yolks. 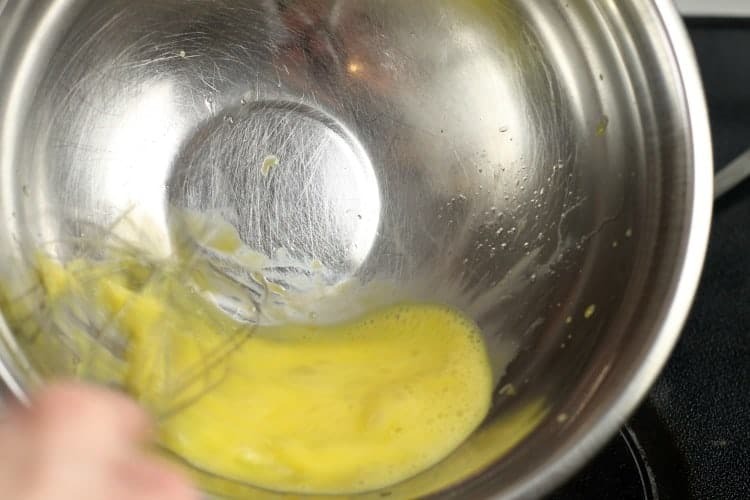 If the hollandaise starts to get too thick add a tiny splash of hot water to thin it out and immediately whisk it in. So simple!? I am all for making at home and from scratch but I never thought to make my own Hollandaise sauce. I guess I always thought it would be complicated. So glad that you are doing this series. Thank you! I hope this post gives you the confidence to try it! Hollandaise simply takes practice, I will hopefully do a tutorial video soon!